MITP hosts several programs per year, each lasting for a period of up to four weeks. These programs are organized by a small team of scientists. Each will be attended by up to 25 scientists at any given time, who are expected to spend at least two weeks at MITP. Local housing expenses for accepted participants will be covered by MITP. The MITP guest relations team will arrange for housing according to the individual needs of participants. There is the possibility to organize a MITP conference of 2-5 days at the end of a scientific program designed for a broader audience of up to 50 scientists including experimentalists. This allows for a fruitful interaction of theorists and experimentalists. 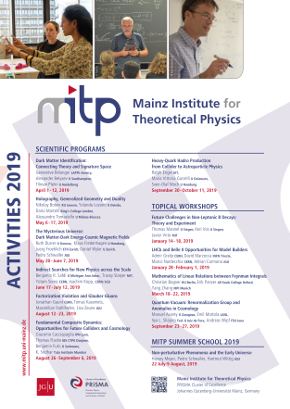 MITP offers to the scientific community the opportunity to hold one-week workshops devoted to a specific topic at the forefront of current research with a maximum number of 30 participants. MITP provides sufficient funds for participants and organizers. MITP also hosts guest scientists and research collaborations for extended stays independent of running workshops and programs. It grants individual fellowships for up to one month. 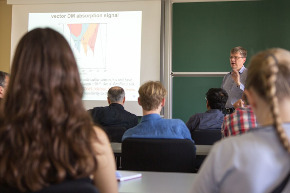 Small groups of researchers may use the MITP facilities for concentrated (collaborative) work on a particular research project in theoretical physics. Especially young researchers are encouraged to apply.